Please contact me by email if you require a PDF reprint. Jong Chan Lee, Dong Eun Lee and Thomas Schultz, 'High-resolution rotational Raman spectroscopy of benzene', Phys. Chem. Chem. Phys., , (2019). Christian Schröter, Jong Chan Lee and Thomas Schultz, 'Mass-correlated rotational Raman spectra with high resolution, broad bandwidth, and absolute frequency accuracy', Proc. Natl. Acad. Sci. U. S. A., 115, pp 5072 (2018). Christian Neidel, Kuehn Andreas, Claus Peter Schulz, Ingolf V. Hertel, Michael W. Linscheid and Thomas Schultz, 'Femtosecond laser-induced dissociation (fs-LID) as an activation method in mass spectrometry', Chem. Phys., 514, pp 106 (2018). Andrey E. Boguslavskiy, Oliver Schalk, Niklas Gador, William J. Glover, Toshifumi Mori, Thomas Schultz, Michael S. Schuurman, Todd J. Martinez, and Albert Stolow, 'Excited state non-adiabatic dynamics of the smallest polyene, trans 1, 3-butadiene. 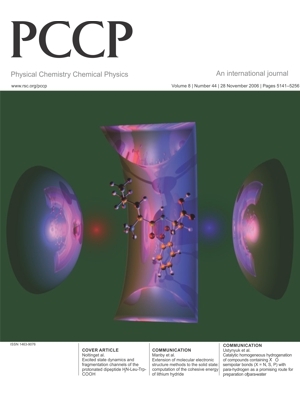 I. Time-resolved photoelectron-photoion coincidence spectroscopy', J. Chem. Phys, 148, pp 164302 (2018). Christian Schröter, Chang Min Choi and Thomas Schultz, 'CRASY: Correlated Rotational Alignment Spectroscopy Reveals Atomic Scrambling in Ionic States of Butadiene', J. Phys. Chem. A, 119, pp 1309 (2015). B. K. McFarland, J. P. Farrell, S. Miyabe, F. Tarantelli, A. Aguilar, N. Berrah, C. Bostedt, J. D. Bozek, P. H. Bucksbaum, J. C. Castagna, R. N. Coffee, J. P. Cryan, L. Fang, R. Feifel, K. J. Gaffney, J. M. Glownia, T. J. Martinez, M. Mucke, B. Murphy, A. Natan, T. Osipov, V. S. Petrović,	S. Schorb, T. Schultz, L. S. Spector, M. Swiggers, I. Tenney, S. Wang, J. L. White, W. White and M. Gühr, 'Ultrafast X-ray Auger probing of photoexcited molecular dynamics', Nature Communications, 5, 4235 (2014). Christian Schröter, Kyriaki Kosma, Thomas Schultz, 'Correlated Rotational Alignment Spectroscopy of Isolated Molecules and Molecular Mixtures', EPJ Web of Conferences, 41, 12013 (2013). B. K. McFarland, J. P. Farrell, N. Berrah, C. Bostedt, J. Bozek, P.H. Bucksbaum, R. Coffee, J. Cryan, L. Fang, R. Feifel, K. Gaffney, J. Glownia, T. Martinez, M. Mucke, B. Murphy, S. Miyabe, A. Natan, T. Osipov, V. Petrovic, S. Schorb, T. Schultz, L. Spector, F. Tarantelli, I. Tenney, S. Wang, W. White, J. White and M. Gühr, Probing nucleobase photoprotection with soft x-rays', EPJ Web of Conferences, 41, 7004 (2013). Franziska Buchner, Hans-Hermann Ritze, Marcus Beutler, Thomas Schultz, Ingolf-Volker Hertel and Andrea Lübcke, 'Excited state dynamics of liquid water near the surface', EPJ Web of Conferences, 41, 6006 (2013). Natalie Preissler , Franziska Buchner , Thomas Schultz , and Andrea Lübcke, 'Electrokinetic Charging and Evidence for Charge Evaporation in Liquid Microjets of Aqueous Salt Solution', J. Phys. Chem. B, 117 (8), pp 2422 (2013). Franziska Buchner, Hans-Hermann Ritze, Marcus Beutler, Thomas Schultz, Ingolf V. Hertel and Andrea Lübcke, 'Role of alkali cations for the excited state dynamics of liquid water near the surface', J. Chem. Phys., 137, 024503 (2012). Franziska Buchner, Thomas Schultz, Andrea Lübcke, 'Solvated electrons at the water-air interface: surface versus bulk signal in low kinetic energy photoelectron spectroscopy', Phys. Chem. Chem. Phys., 14, pp 5837 (2012). Christian Schröter, Kyriaki Kosma, Thomas Schultz, 'CRASY: Correlated Rotational Alignment Spectroscopy', Science, 333, pp 1011 (2011). Thomas Schultz, 'Photochemistry of DNA Bases and Base Pairs', Habilitation manuscript. F. Buchner, A. Lübcke, N. Heine, I.V. Hertel, and T. Schultz, 'Time-resolved photoelectron spectroscopy from aqueous solutions', Rev. Sci. Instrum., 81, 113107 (2010). A. Lübcke, F. Buchner, N. Heine, I.V. Hertel, and T. Schultz, 'Time-resolved photoelectron spectroscopy of solvated electrons in aqueous NaI solution', Phys. Chem. Chem. Phys., 12, 14629 (2010). M. Margraf, B. Nöller, C. Schröter, T. Schultz, and I. Fischer 'Time- and Frequency-Resolved Photoionization of the C 2A2 State of the Benzyl Radical, C7H7', J. Chem. Phys., 133, 074304 (2010). V.R. Smith, E. Samoylova, H.-H. Ritze, W. Radloff, and T. Schultz, Electronic Structure and Dynamics of Microhydrated Adenine Clusters, Phys. Chem. Chem. Phys. , 12, 9632 (2010). Kyriaki Kosma, Christian Schröter, Elena Samoylova, Ingolf Volker Hertel, and Thomas Schultz, Excited-State Dynamics of Cytosine Tautomers, J. Am. 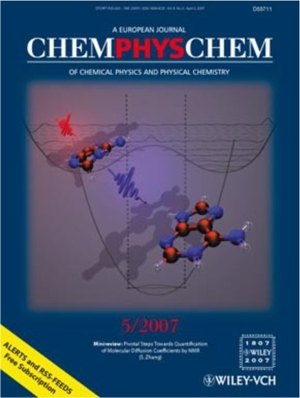 Chem., 131, 16939 (2009). Elena Samoylova, Wolfgang Radloff, Hans-Hermann Ritze, Thomas Schultz, Observation of Proton Transfer in 2-Aminopyridine Dimer by Electron and Mass Spectroscopy, J. Phys. Chem. A, 113 (29), pp 8195 (2009). Bastian Noller, Markus Margraf, Christian Schröter, Thomas Schultz, and Ingo Fischer, Excited-State Lifetime of Propadienylidene, l-C3H2, Phys. Chem. Chem. Phys., 11, 5353 (2009). Jesús González-Vázquez, Leticia González, Elena Samoylova, Thomas Schultz, Thymine Relaxation after UV Irradiation: the Role of Tautomerization and πσ* States, Phys. Chem. Chem. Phys., 11, 3927 (2009). E. Samoylova, T. Schultz, I.V. Hertel, W. Radloff, 'Analysis of ultrafast relaxation in photoexcited DNA base pairs of adenine and thymine', ChemPhys, 347, 376 (2008). N. Gador, E. Samoylova, V.R. Smith, A. Stolow, D.M. Rayner, W. Radloff, I.V. Hertel, T. Schultz, ' Electronic Structure of Adenine and Thymine Base Pairs Studied by Femtosecond Electron-Ion Coincidence Spectroscopy', J. Phys. Chem. A, 111, 11743 (2007). D. Nolting, R. Weinkauf, I.V. Hertel and T. Schultz, Excited state relaxation of protonated adenine, ChemPhysChem., 8, 751 (2007). V. Bonacic-Koutecky, B. Brauer, W. Eberhardt, R.B. Gerber, L. Gonzalez, G. von Helden, A. Kammrath, S. K. Kim, J. Manz, G. Meijer, R. Mitric, M. Neeb, D. Neumark, T. Schultz, J. Stanzel; in Analysis and Control of Ultrafast Photoinduced Reactions; O. Kühn, L. Wöste (eds. ); Springer Series in Chemical Physics Vol. 87, Springer, Heidelberg, 2007; 155ff and 184-192. E. Samoylova, V.R. Smith, H.-H. Ritze, W. Radloff, M. Kabelac, and T. Schultz, Ultrafast deactivation processes in aminopyridine clusters: Excitation energy dependence and isotope effects, J. Am. Chem. Soc., 128, 15652 (2006). E. Samoylova, V.R. Smith, H.-H. Ritze, W. Radloff, I.V. Hertel, T. Schultz, Photochemistry and dynamics of base pairs, Femtochemistry VII, Fundamental Ultrafast Processes in Chemistry, Physics, and Biology, Welford Castleman edt. (Elsevier Amsterdam 2006), p. 367. D. Nolting, T. Schultz, I.V. Hertel, and R. Weinkauf, Excited state dynamics and fragmentation channels of the protonated dipeptide H2N-Leu-Trp-COOH, Phys. Chem. Chem. Phys., 8, 5247 (2006). H.-H. Ritze, H. Lippert, E. Samoylova, V.R. Smith, I.V. Hertel, W. Radloff, and T. Schultz, Relevance of pi-sigma* states in the photoinduced processes of adenine, adenine dimer and adenine-water complexes, J. Chem. Phys., 122, 224320 (2005). M. Zierhut, B. Noller, T. Schultz and I. Fischer, Excited-State Decay of Hydrocarbon Radicals, in-vestigated by Femtosecond Time-Resolved Photoionization: Ethyl, Propargyl, and Benzyl, J. Chem. Phys., 122, 094302 (2005). E. Samoylova, H. Lippert, S. Ullrich, I.V.Hertel, W. Radloff and T. Schultz, Dynamics of photoinduced processes in adenine and thymine base pairs, J. Am. Chem. Soc., 127, 1782 (2005). T. Schultz, E. Samoylova, W. Radloff, I.V. Hertel, A.L. Sobolewski, W. Domcke, Efficient Deactivation of a Model Base Pair via Excited-State Hydrogen Transfer, Science, 306, 1765 (2004). S. Ullrich , T. Schultz , M.Z. Zgierski and A. Stolow, Electronic relaxation dynamics in DNA and RNA bases studied by time-resolved photoelectron spectroscopy, Phys. Chem. Chem. Phys., 6, 2796 (2004). S. Ullrich, T. Schultz, M.Z. Zgierski, A. Stolow, Direct observation of electronic relaxation dynamics in adenine via time-resolved photoelectron spectroscopy, J. Am. Chem. Soc., 126, 2262 (2004). T. Schultz, J. Quenneville, B. Levine, A. Toniolo, T.J. Martinez, S. Lochbrunner, M. Schmitt, J.P. Shaffer, M.Z. Zgierski, A. Stolow, Mechanism and dynamics of azobenzene photoisomerization, J. Am. Chem. Soc., 125, 8098 (2003). M. Smits, C.A. de Lange, S. Ullrich, T. Schultz, M. Schmitt, J.G. Underwood, J.P. Shaffer, D. M. Rayner, A. Stolow, Stable kilohertz rate molecular beam laser ablation sources, Rev. Sci. Instrum., 74, 4812 (2003). J.P. Schaffer, T. Schultz, J.G. Underwood, C.C. Hayden, A. Stolow Time-Resolved Photoelectron Spectroscopy: Charge and Energy Flow in Molecules , in Ultrafast Phenomena XIII, R.D. Miller, M.M. Murnane, N.F. Scherer, A.M. Weiner, Eds. (Springer, Berlin 2002), p.71. S.-H. Lee, K.-C. Tang, I-C. Chen, M. Schmitt, J.P. Shaffer, T. Schultz, J.G. Underwood, M.Z. Zgierski, and A. Stolow, Substituent effects in molecular electronic relaxation dynamics via time-resolved photoelectron spectroscopy: pp* states in benzene, J. Phys. Chem., 106, 8979 (2002). S. Lochbrunner, T. Schultz, M. Schmitt, J.P. Schaffer, M.Z. Zgierski, A. Stolow, Dynamics of excited state proton transfer systems via time-resolved photoelectron spectroscopy, J. Chem. Phys., 114, 2519 (2001). S. Lochbrunner, M. Schmitt, J.P. Shaffer, T. Schultz, A. Stolow,  Time-resolved photoelectron spectroscopy of excited state intramolecular proton transfer dynamics, in Ultrafast Phenomena XII, T. Elsässer, S. Mukamel, M.M. Murnane, N.F. Scherer, Eds. (Springer, Berlin 2000), p.642. J. P. Shaffer, T. Schultz, M. Schmitt, J. G. Underwood, A. Stolow, Untangling p-p* / n-p* orbital interactions via time-resolved photoelectron spectroscopy, in Ultrafast Phenomena XII, T. Elsässer, S. Mukamel, M.M. Murnane, N.F. Scherer, Eds. (Springer, Berlin 2000), p.339. S. Lochbrunner, J.J. Larsen, J.P. Shaffer, M. Schmitt, T. Schultz, J.G. Underwood, A. Stolow, Methods and applications of femtosecond time-resolved photoelectron spectroscopy', J. Electron Spectrosc. and Relat. Phenom. , 112, 183 (2000). T. Schultz, J. S. Clarke, H.-J. Deyerl, T. Gilbert, I. Fischer, Time- and frequency- resolved photoionisation of the allyl radical, Faraday Discussions, 115, 17 (2000). T. Schultz and I. Fischer, The UV band system of the allyl radical, studied by time-resolved photoelectron spectroscopy, in Ultrafast Phenomena XI (Springer, Berlin 1998). T. Schultz, I. Fischer, Time-resolved photoelectron spectroscopy of the allyl radical: the lifetimes of the ultraviolet bands, J. Chem. Phys., 109, 5812 (1998). T. Schultz, I. Fischer, The nonradiative decay of the allyl radical excited B 2A1 state studied by picosecond time-resolved photoelectron spectroscopy, J. Chem. Phys., 107 (19), 8197 (1997). T. Schultz, I. Fischer, Two photon photoelectron spectrum of methyliodide through a dissociative intermediate state, J. Phys. Chem. A , 101, 5031 (1997). I. Fischer, T. Schultz, Generation of tunable visible and near-IR light from 2.5ps, high-power Ti:sapphire pulses by Raman shifting in hydrogen, Appl. Phys. B, 64, 15 (1997).